Robert Shearman. Photo by Mark Blackman. By Mark L. Blackman: The night of Tuesday, April 28, 2015 featured a special event, a “hybrid” of the New York Review of Science Fiction Readings and an episode of Jim Freund’s WBAI-FM radio program, Hour of the Wolf. The world’s longest-running science fiction/fantasy radio show (now in its 44th year), Hour of the Wolf broadcasts and streams every Wednesday night/Thursday morning in New York from 1:30-3:00 am at 99.5 FM and worldwide at hourwolf.com. The combination was a natural one as Freund is also producer/executive curator of the Readings Series, and has, in fact, been taping the readings and airing them on his show almost from their inception nearly 25 years ago. Transmitting from the Series’ alternate venue, the newly renovated Brooklyn Commons, the evening’s guest was London-based author, playwright and radio/tv scriptwriter Robert Shearman. The Brooklyn Commons has been transformed into a high-tech café with its main space converted for all forms of multimedia and, while the program was being taped for radio broadcast the next night, it was live on Livestream (and, for those who missed it, it still available to be viewed); there were, however, a few bugs in the system, delaying the start for nearly half an hour. (The reverb was a form of echo-terrorism.) Finally, Freund was able to welcome the audience to “the first Hour of the Wolf tv show” (sort of, with Livestream utilizing three robotic cameras). 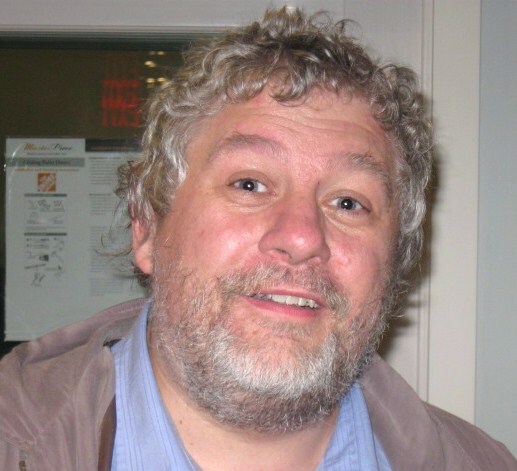 He reported – to hearty applause – that his upcoming show would be the last from WBAI’s studios at CCNY, and that, as of Friday, May 1, the station (and thus his program) would be broadcasting from the third floor of the Brooklyn Commons building. Continuing, he noted that this was the second event in “our Brooklyn trilogy” of three consecutive Tuesdays at the Brooklyn Commons. Last week’s featured “the two Sams (Delany & Miller),” and next week’s (Tuesday, May 5, Cinco de Mayo) readers would be Sheree Renée Thomas and N.K. Jemisin. The June 2 readings will be back at the SoHo Gallery for Digital Art (aka Gallery La La) in Manhattan, with Ron Hogan as guest curator presenting Lev A.C. Rosen and Adam Sternbergh, “two disastrous writers,” that is, the authors of apocalyptic novels set in (of course) New York. Concluding his opening remarks, Jim introduced his guest co-host, Ellen Datlow, “who fostered the evening,” and who, by the way, has just returned from a trip to China. Datlow has edited more than fifty anthologies, and is the most honored editor in the sf/fantasy/horror field, having received (more than once in a few instances) the World Fantasy Award, the Bram Stoker Award, the Karl Edward Wagner Award, the International Horror Guild Award, the Shirley Jackson Award, the Locus Award, and the Hugo Award. (What does one do after two Lifetime Achievement Awards [Horror Writers Association and WFA]? Certainly not retire.) She is also the co-host of the monthly Fantastic Fiction Readings at the KGB Bar in the East Village. She introduced the evening’s featured guest. Robert Shearman’s short stories have won the World Fantasy Award, the Shirley Jackson Award, the Edge Hill Readers’ Prize and three British Fantasy Awards, while his plays have won the World Drama Trust Award, the Sophie Winter Memorial Trust Award, and the Guinness Award for Ingenuity. His black comedy, Easy Laughter, which is currently running Off-Broadway and which he is in New York to promote, is the winner of the (London) Sunday Times Playwriting Award. Rob, though, is probably best-known here as the writer of “Dalek,” a pivotal episode in the revived series of Doctor Who, starring Christopher Eccleston as the ninth Doctor, and a nominee for the Hugo Award for Best Dramatic Presentation, Short Form. Jim returned to the spotlight to conduct an interview of Shearman. 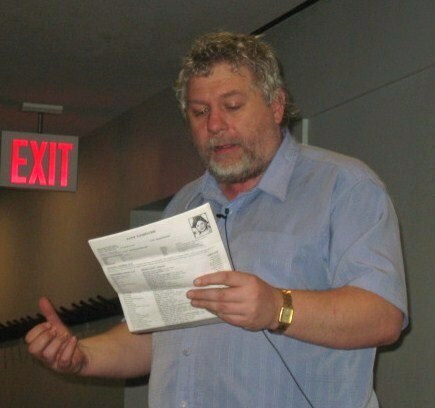 Robert Shearman at NYRSF Reading. Photo by Mark Blackman. New York, said Shearman, feels like a movie set and feels so familiar. (Jim felt the same way about London.) Having a childhood stammer, to overcome it, he began appearing on stage, and started writing plays to get a part; then, because he “didn’t want an actor as bad as me to ruin it,” he became a fulltime writer. His first radio plays were adaptations, then he shifted to writing original works. TV, he commented, is “very unsubtle,” whereas radio, his preference, is “very ambiguous.” (During a later break, I wondered about that. True, radio lets listeners use their imaginations, but, at the same time, it didn’t seem “subtle” to have action being narrated, and then there were things like, for example, Superman shouting “Up, up and away!” to tell the audience that he was flying or change his voice to show that he’d changed from Clark Kent. “That’s just bad exposition,” said Shearman; there were ways around that.) Jim and Rob chatted a bit about radio groundbreakers like The Goon Show, (in the U.S.) Firesign Theatre and, of course, The Hitchhiker’s Guide to the Galaxy; both greatly admired Douglas Adams. Rob feels “a bit guilty” about doing TV. On the set, he was impressed that the new incarnation of Doctor Who actually “had a budget,” unlike the series’ original run; there were CGI Daleks! In the episode, he pointed out, Eccleston’s Doctor who, until then, had been unflappable, was actually scared. The torture scene pushed the envelope. The graffiti “Bad Wolf,” he revealed, was just there accidentally, and didn’t have meaning until showrunner Russell Davies decided to give it meaning; and it worked, said Freund, because it developed slowly. His second story was briefer. Over the PA, a flight attendant advises the passengers on an intercontinental flight from LA about to land in Paris that they are required to have faith in the existence of Paris in order to arrive safely. (83% of the airline’s passengers, she reports proudly, survive their flights.) Vivid memories are encouraged to be brought up and photos of city scenes are displayed to assist them. As customary at these Readings, the Jenna Felice Freebie Table offered giveaway books, and refreshments (cheese and crackers). The crowd of about 20 included Melissa C. Beckman, Barbara Krasnoff (floor manager), John Kwok, Gordon Linsner, Edie Nugent (publicist for Dirt [Contained]) and Terence Taylor (the event’s video producer), some half of whom adjourned afterward with Jim, Ellen and Rob to a nearby bar and grill. This entry was posted in Like Show Business and tagged Ellen Datlow, Jim Freund, Mark Blackman, NYRSF, Robert Shearman by Mike Glyer. Bookmark the permalink. If “Dalek” had been called something like “Last of his kind” and the BBC promos department had had their wrist slapped every time they reached for a tape showing the Dalek, you’d have been able to spot it’s first appearance on a seismograph.